The Group’s TV division’s consolidated market share numbers evolved in November during PrimeTime and Access, compared to the same period of last year. This appreciation is corespondent throughout the whole year so far (January-November 2017), with 2% increase during PrimeTime and 3% during Late Fringe intervals, vis-à-vis the same period in 2016. Antena 1, the flagship entertainment channel, home to the largest star system in Romania, appreciated its market share by 2% in November, on the commercial target, while YTD (January-November 2017) the market share numbers evolved by a percent during PrimeTime and 3% during late Fringe, compared to the same period of last year. The in-house productions “Chefi la Cutite”(average rating 11,7%), “IUmor” (average rating 9,6%) , “Baieti de oras” and “X Factor” topped the audience charts in November. 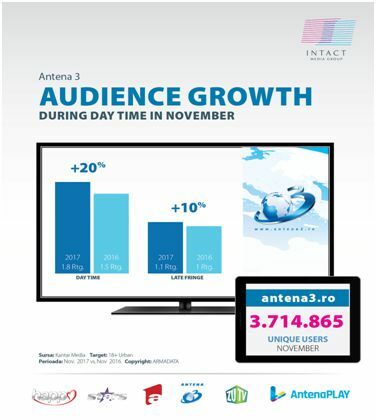 Antena 1 reached 7, 9 million viewers in November, during Whole Day, for at least one minute, whilst www.A1.ro had 3.841.556 unique users. Antena Stars, the only TV channel dedicated to showbiz, appreciated its audience by 33% on the Late Fringe segment in November, on the commercial target, compared to the same period of last year. At the same time, the market share evolved by 6% during morning and by 25% during Late Fringe. Antena Star’s programs reached over three million Romanians in November, during the Whole Day, for at least one minute. The most popular productions were “Agentia VIP”, “Star Magazin Special”, ”Rai da buni”, “Dincolo de aparente” and the series “ Alege Dragostea”. 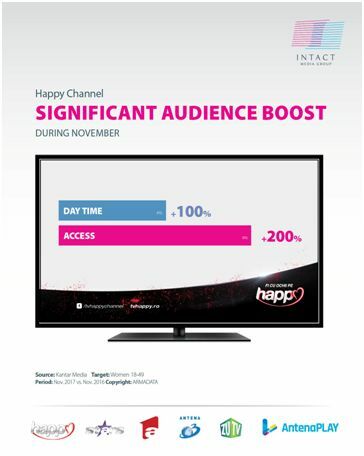 For Happy Channel, the Group’s TV station addressed to women, November saw double and even triple audience numbers during the Day Time, respectively Access intervals, whilst the market share consolidated on most time intervals, among which Day Time (71%) and Access (100%), compared to November 2016. The most popular series of the station included “Intrusul” (Insider) “Iubire si razbunare” (Brave and beautiful) “Elif”, “Esmeralda”, “Nord si Sud” (North and South). Happy Channel reached over a million viewers every day, in November, for at least one minute on the National level. Antena 3 consolidated it leadership of the news niche through audience and market share appreciation, on the majority of intervals in November, amongst which Whole Day and Prime Time. Moreover, the audience and market share numbers have evolved since the start of the year (January-November 2017) as compared to the same period of 2016. The audience appreciation includes Whole Day (6%) and Prime Time (3%) intervals on the 18+ urban target. Antena 3 reached almost 4 million viewers every day, on the National level. “Voi cu Voicu”, “Adevăruri Ascunse”,“Sinteza Zilei”, “In Premiera” and “Punctul de Intalnire”. were the most watched programs over the last month. At the same time, Antena3.ro had 3.714.865 unique viewers. On the digital front, www.a1.ro is in top 10 all sites.ro, with 3.841.556 unique visitors, over 10 million visits and more than 19 million views. Furthermore, a1.ro led the entertainment niche in November, position it has held every month over the last four years, with numbers almost double than its main competitor. In terms of video content, a1.ro platform comes third, after youtube and Facebook. Other sites in the Group, spynews.ro and antena3.ro, were on the second positions in the celebrities, respectively news categories. 9.629.000 Romanians were reached by Intact’s family of TV channels in November, during the Whole Day, for at least one minute, on national level, while 7.058.000 were reached during Prime Time.